At day end, customer would be automatically re-subscribed to the offer and the subscription fee would be deducted from his account. An SMS notification would also be sent to the customer at the time of re-subscription. This offer will be available to customers of all Jazz packages. 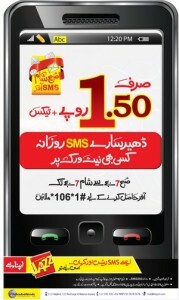 One Response to "Mobilink Jazz Subha Sham SMS Offer"